Mad About Meghan: Meghan in Summery Self-Portrait Dress for Invictus Reception! Meghan in Summery Self-Portrait Dress for Invictus Reception! 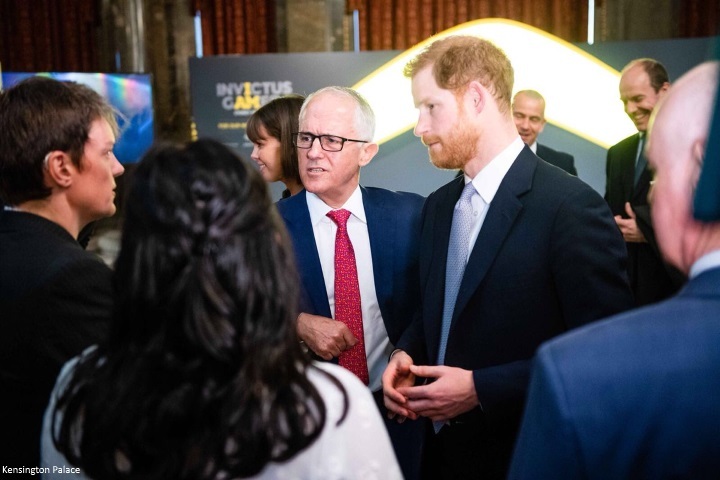 Prince Harry and Meghan Markle attended a reception hosted by the Hon Malcolm Turnbull, Prime Minister of Australia and his wife Lucy, celebrating the forthcoming Invictus Games Sydney 2018. Meghan pictured arriving for the reception at the Australian High Commission, Australia House. 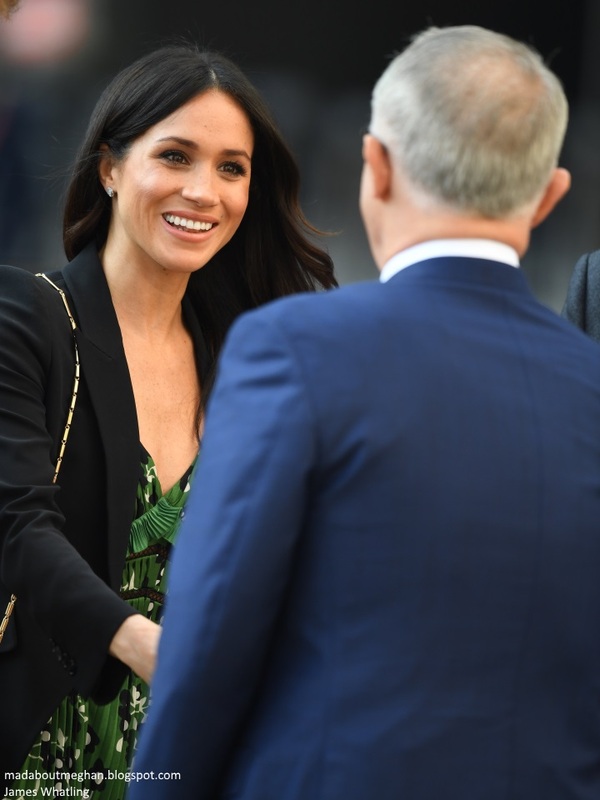 Meghan was greeted by PM Malcolm Turnbull. 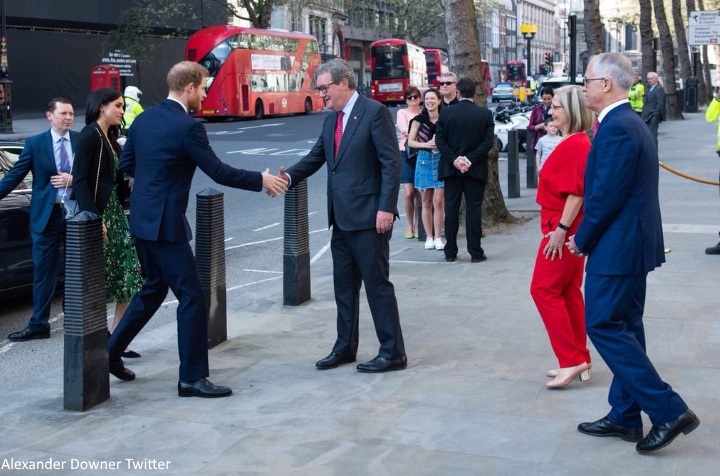 Prince Harry is welcomed by Australian High Commissioner to the UK Alexander Downer. The Invictus Games is the only international sporting event for wounded, injured and sick (WIS) servicemen and women, both serving and veteran. The Games use the power of sport to inspire recovery, support rehabilitation and generate a wider understanding and respect of all those who serve their country. Sydney is the fourth city to host the Invictus Games, after London in 2014, Orlando in 2016, and Toronto in 2017. Harry and Meghan will travel to Sydney in October for the event. It is thought the trip will be combined with a tour of Australia, New Zealand and possibly Fiji, although it is in the early stages of planning. With the Commonwealth Heads of Government Meeting this week, the focus is very much on strengthening ties; this morning's reception seems a very fitting way to celebrate the games which has links all over the Commonwealth. Prince Harry with UK and Australian servicemen and women, some of whom have experience of competing in the Invictus Games. 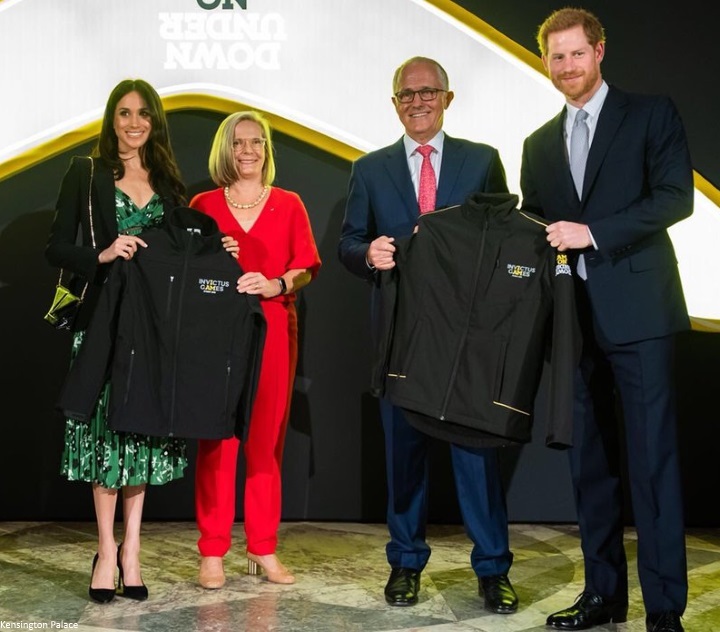 Harry and Meghan were presented with Invictus Sydney jackets by the Turnbulls. Below, an excellent video from the engagement. It's a great wrap up of the morning and there's a very sweet moment where Harry calls "Meg" over to meet Invictus competitors. It's been a glorious week of sunshine in London; Meghan was perfectly attired for the gorgeous weather in the Self-Portrait Cold-Shoulder Floral-Print Midi Dress. It's wonderful to see a vibrant pop of colour in Meghan's wardrobe and a hint of what we can expect for her summer engagements. 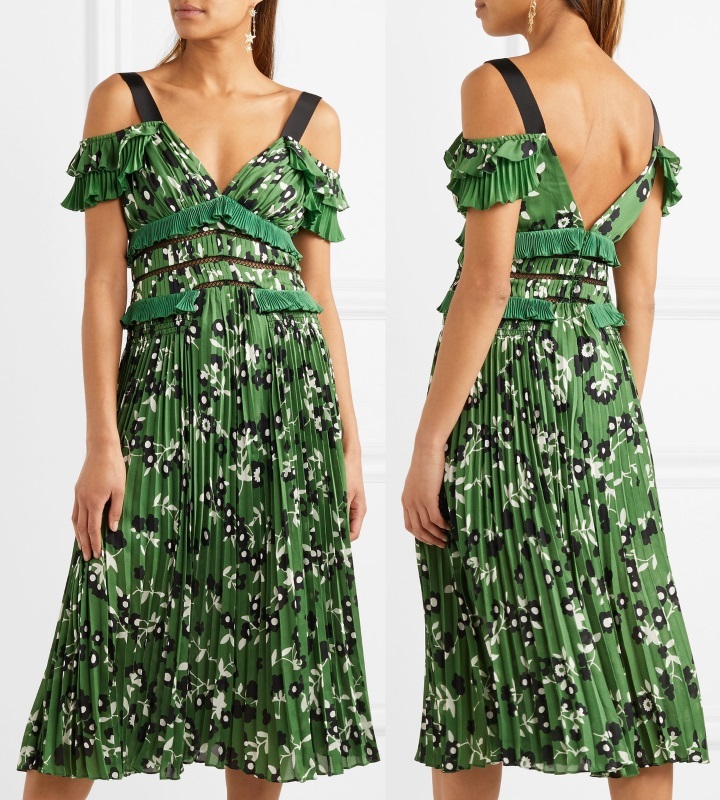 The green, black and white cold-shoulder style dress is made from floral-print crepe, it's trimmed with plissé ruffles and latticed lace inserts. It features a sweetheart neckline and a fitted bodice. It's available at Bergdorf Goodman, Harrods, Neiman Marcus, My Theresa and Nordstrom. I love the green print. 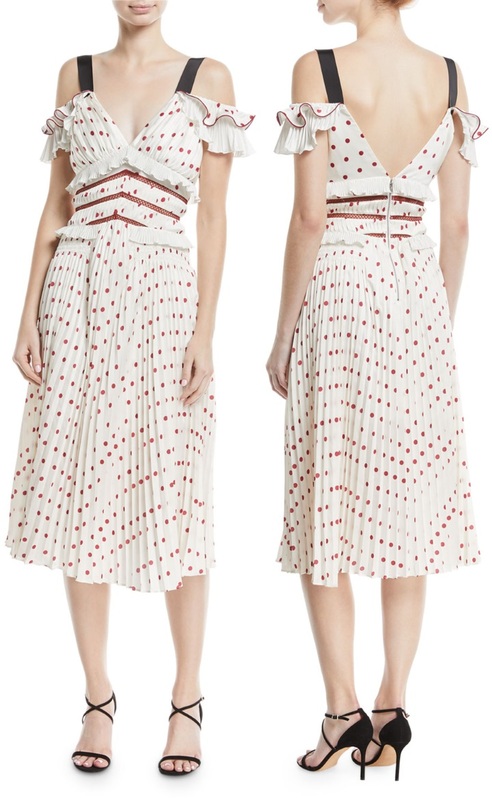 The dress also comes in a Polka Dot print as shown at Neiman Marcus. Meghan brought back the Alexander McQueen jacket and Manolo Blahnik BB pumps she wore for the Endeavour Fund Awards in February. It's interesting to see the same pieces styled for two very different events. 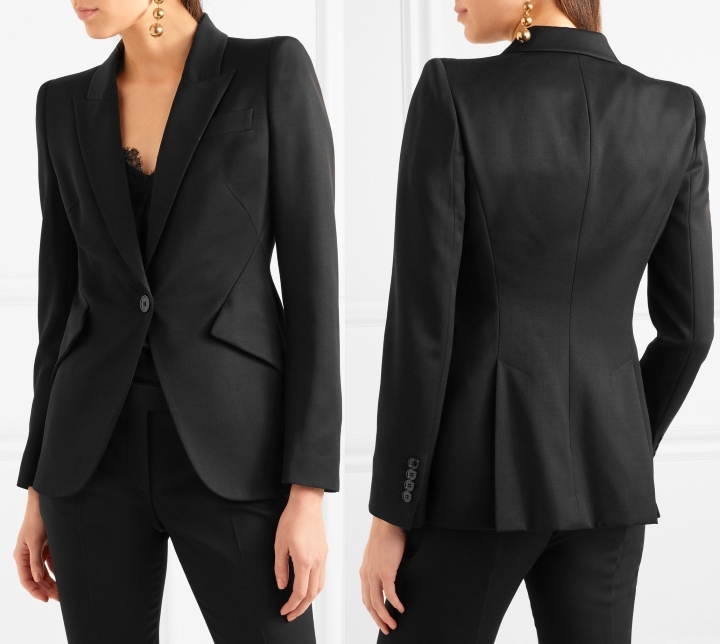 The £1,245 McQueen Grain de poudre wool blazer is described as being "made from grain de poudre wool, this satin-lined blazer has sharp peaked lapels, structured shoulders and angular flap pockets that draw attention to the smallest part of your frame". 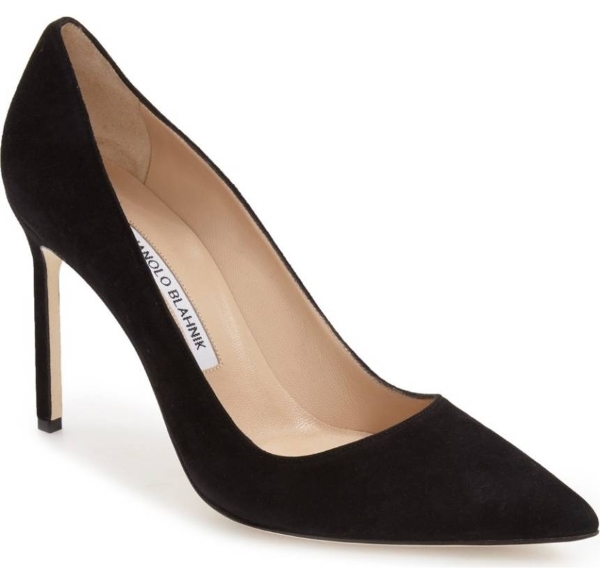 Meghan's Manolo BB pumps remain available at Nordstrom. Perth Fashion identified Meghan's stylish new bag as the Roland Mouret Mini Classico patent leather cross-body bag. It's available in several colours at Roland Mouret. Meghan's earrings are the Cartier Galanterie Earrings (with thanks to Anne and Laura). It is very likely Meghan will join Harry for the Queen's Birthday Party at the Royal Albert Hall tonight. It begins at 8 pm and will be televised on BBC One. Just one word! Gorgeous! Love the entire outfit! It's great to see them so often,this couple is determined to work. Meghan is learning the royal job very intensively and she looks happy. The dress is not my favorite I don't like the design and with this blazer the outfit looks odd. But I must say she is pretty in green! Eugenie, I must say I agree with this blazer the outfit looks odd. I like the dress other ways but not the top of it. Love Meghan! Don’t love the dress. I hope she doesn’t take off her jacket. The back is way to plunging for an official event. The fitted jacket doesn’t match the flowy dress. But she is so awesome that I’m not sure it really matters. Agree Kelly,I had exactlythe same thoughts. I think a cardigan would have looked a bit better with this dress. See! Very casual looking dress but with the jacket she can get away with it! Not what I would have chosen for this but she looks great and I love the pieces. Meghan looks terrific. That dress is a terrific cut and color for her. I personally am not a fan of cold shoulder dresses, so I don't love the dress itself but it is great for Meghan. The blazer is a great complement. Professional but in keeping with the style of the dress. Great outfit for a reception in the afternoon! Well said Katie C.H. I'm also not a fan of cold shoulder dresses but I'm particularly happy that she put the blazer ON this time and didn't drape it over her like she did on Wednesday. Without the blazer, this dress would have been too casual for a reception with a PM. Lovely print and colour tho. And the bag, thank goodness the bag stayed on one shoulder, it's way more elegant this way. I have never disliked an outfit more than I did on Wednesday but I have to give credit where it's due and say that this outfit is 10 times better! Keep it up girl! Like this dress for spring 🌿 and good this time she has a blazer on! Lovely dress. Finally some real color! That reminds me of a scene from "Four Weddings and a Funeral-" the one where a young lady at a wedding reception was trying to sign the word "nice." Haha! maybe it's part of the aging process, but everything reminds me of something from a movie these days. Even Meghan's dress today-the pink polka-dot version. It reminds me of a dress another MM wore in a film-can't recall which one. oooh, i love this dress! so pretty, and flattering, and spring-y! and perfect fit for her body. she formalized it with the blazer and heels, as appropriate for the event, which i get. but i'm hoping we'll get a pic without the jacket. i do wish she wore longer earrings, though. Longer earrings would really have been nice, I agree! Another win for me with this outfit! Love the lush green color and appreciate that she kept her blazer on with the sleeveless top of the dress. Overall she looks wonderful. Love her hair and simple shoes to go with the more busy dress pattern. I am beyond excited for the wedding!! Is anyone in the Boston area having a watch party? I can’t decide what I want to do. Part of me just wants to be alone so I have no distractions and can have to TV, laptop, and phone all going simultaneously...but another part of me wants to be with others who are as excited as I am lol. I did see that a couple of Boston hotels are having fancy dress watch party breakfasts so I might join one of those, but just wanted to hear what my fellow Bostonians are doing (and everyone else on my favorite Meghan blog too)!! Although maybe Charlotte plans a separate post to discuss wedding watch plans so I don’t mean to hijack this thread. Back to today’s event, it’s so exciting to see them both there for IG Sydney. Can’t wait to see if Meghan will play any formal role or if she’ll just be a guest like with IG Toronto. I’m also curious to see if they combine the trip to Sydney with a larger foreign tour. My guess is they will but their first foreign tour will be to Canada over the summer. Will and Kate did their first tour 2 months post wedding so I’m imagining Harry and Meghan will be about the same. I don’t think they will wait for IG in the fall (5 months post wedding) to be their first foreign tour. But...what do I know lol. Interesting that she stuck to classic courts today, as you say, plenty going on with that heavenly dress. Lol, inthekitchen! I invited my sister to come and watch the wedding but now I have to say that I'm regretting that a bit :( I love my sister and have the best time with her but she knows next to nothing about the royals so everytime we watch a royal-based show together I have to frequently pause it to explain different people, protocols, etc. When I really just want to get up at 3am and geek out on the royals all by myself! A wedding breakfast watch party sounds so fun! I live in a very rural area so nothing like that going on here. I'll be by myself watching every glorious moment. I'm in Boston too (Newton!) What hotels are having events? P.S. thank you Charlotte for all of the amazing work you do on this blog. It’s not that I’m obsessed or anything ;) but your blog is usually the first thing I check in the morning. You always have such thorough, well written posts and gorgeous pictures, and I appreciate that you don’t allow bigoted or vitriolic comments about Meghan. It makes for such nicer reading than one of the royal boards I had been frequenting. However people lost their minds when Meghan came into the scene and that site is now filled with such ridiculous hateful posts that I rarely visit anymore. So, I appreciate your behind-the-scenes work as well with screening your comment section. Thank you (and sorry you have to read through such hateful comments as you screen)!!! Thε perfect quality of this blog is rare! One of the very, very few times (if any?) I have to disagree with you, Charlotte: NO, we´re NOT too kind, dearest Charlotte (don´t worry, I know how you mean it, just a little taking things VERY literal here, lol!! ), IT IS WELL DESERVED!!! MAM is on my "top bar list" - and checking DKB is always next... We cannot thank you enough. It´s one hell of a tough job to get a blog like this running - and running smoothly on top of that (see comments section!). I´m gladly repeating myself: YOU ROCK!! We´re blessed to have you!! Seems like we all have incredibly similar morning routines! I also check Charlotte’s blogs first things in the morning. And I mean first thing! My phone is my alarm clock so I turn off my alarm and then check DKB and this blog. Sometimes I don’t get to read posts until later or I won’t have time to comment until that evening, BUT I always am keeping tabs lol! Such a pretty green print. Lots of details in this dress. I look forward to seeing how Meghan rocks this look. Finally!! An outfit that I love! It`s not all black, it is perfectly appropriate for the location and the season and she looks beautiful! Spot on Meghan! My very first thought: "WOW, Harry looks dapper today!!!" - a good or a bad sign that his clothes caught my eye first? ;-))) LOL!! I really love her hair today! The whole look is feminine, yet the blazer, the bag, the shoes signal "offical occasion". With the blazer on and the bag on her shoulder there was no "confusion" about where she was about to go... Looking forward to seeing more!!! They have a chemistry just gorgeous! I hope she keeps her jacket on! Talk about a complete surprise!! Here's a girl who takes summer seriously. She looks just beautiful---there is even something about her makeup that makes her face look prettier than ever. She looks just about perfect in the top two images. I love the green color and all the ruffles and pleats. Sometimes you need a break from a clean line. Love your second sentence! I am all for taking summer seriously! I think she looks lovely too. "Here's a girl who takes summer seriously"
"Sometimes you need a break from a clean line"
SO right, Allison, SO right!! I feel the same (and often thought exactly sentence number 2 when "having had enough with clean lines" myself, lol!!)!! So for trekking around in castles during the winter, cover up in wool layers. 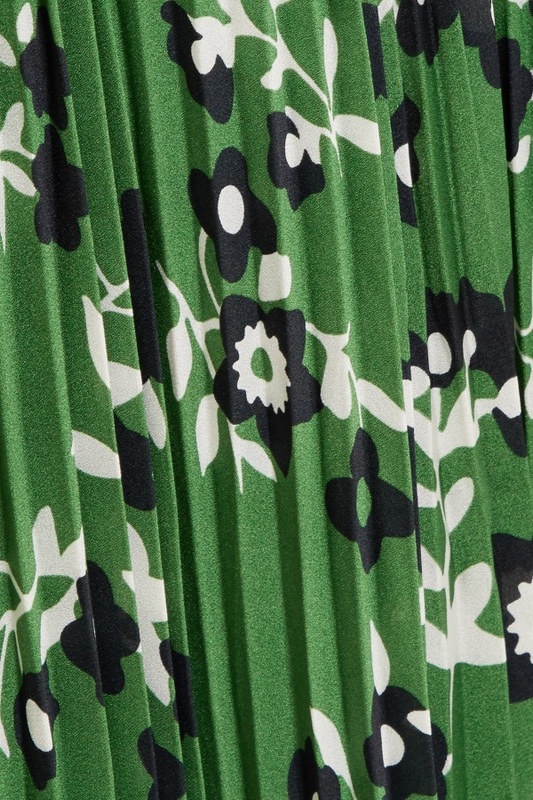 For summer in London, look like a crisp spring flower. And it's not "low cut" as long as major (or even minor) cleavage isn't showing. Her UN speech dress dipped down quite far but it just gives a sleek run of skin, like a marble bust. I wonder if this dress goes to the birthday celebration? I know that starts at 8 pm but I can't figure out when this reception started and how long it ran. Perfection! I wouldn't change anything about this look on her. Absolutely love the outfit! Happy to see the blazer is on. I don’t think we are used to seeing shoulder bags on royal women. So I can’t decide if I am just unfamiliar with it or prefer a clutch. Overall, love it! CP Victoria frequently uses shoulder bags for her engagements. I find it a bit more relateable and more practical as it frees up both hands for shaking and accepting flowers. In fact the Queen never carries a clutch and I don't think Anne does either. I love the green and print of that dress - it was very cohesive and everything fit together nicely. I really do love that Meghan’s style is Meghan’s. I do hope she continues to define her own style path after the wedding. I don’t know if it’s her personality or because of her career but she always seems comfortable and confident at these events. Oh I love this dress on her! It reminds of the red one with flowers she wore when she was out and about in Toronto last summer. I have a question - what made most of you guys think Meghan does not want to wear colors, have you googled some of the things she has worn in the past in the summer? She likes mixing it up, that's why most people are saying wait and see. The dress is lovely with the blazer. Wouldn't be a fan of it with these straps, to be honest. I guess Meghan will be wearing prints after all. Lol. Roland Mouret for the bag (and another gorgeous one in Meghan´s collection at that!!)!! Has anyone else listened to the latest "On Heir" podcast where Omid Scobie and Emily Andrews (if I remember correctly, it is Emily who brought it up, apparently not just a rumour) say that Roland Mouret could be the designer of her wedding dress!!!??? Hint?!! LOL! I love her outfit, it looked just right beween "summery" (it is unusually hot in London) and "formal" (Invictus Games = Sports event after all!). And I have to repeat - I REALLY loved her hair today!! Eve, I did listen to that! I’m getting so excited to finally get to see THE dress—and I love hearing what “experts” are thinking about it, like who they think the designer is, etc. I agree with you on her outfit and her hair. And four weeks?! It’s going to be here before we know it! Perfection, everything that did not seem to work with the other day with the blazer on or off, now works very well. She looks absolutely beautiful! Green is beautiful on her. When she gets jewelry I hope she gets emeralds. And or peridot. They would be lovely on her. Amethysts, bluhare? My jewel pick for her. Some queen, maybe HM, has the most gorgeous amethyst set, but it is a bit clunky for MM. I think Queen Victoria had a delicate tiara and necklace, but it is in a private collection now, I believe. Haha! auto correct just corrected my spelling from "bluehare" to "bluhare." Actually, I was thinking of the other Victoria-CP Victoria of Sweden. There is a tiara and a necklace, an amethyst pendant on a pearl choker, I think. The Queen does have a set that originated with Queen Victoria but it does seem like it would not be to MM's taste. 🌸 I agree. Green does seem to be a color that looks good on Meghan. Spot on--she looks pretty and feminine and neat. This outfit and the lbd she wore to the reception on Thursday have been lovely. The dress earlier in the week for the business meeting would have been fine had she worn the jacket properly and kept it on. Must say I am impressed by the number of engagements she is taking on. Meghan is a beautiful woman and looks lovely as usual! Lovely! Not a fan of the cold shoulder style in general but she can pull it off. The color and print are so pretty and it works nicely with the blazer for a work-ready look. Another hit, for me. Wow! Colour!! Pattern!!! Meghan is bursting out all over today - just gorgeous! I love how the jacket keeps everything proper while underneath lurk wicked black straps and a plunging back - go Meghan! She looks beautiful... but the bag over the shoulder makes it look like she has just arrived or is just about to leave. Seems ok for an outside walk-a-bout event but inside on the stage being presented with something looks a little casual. I agree! When she’s standing onstage with the bag, it looks awkward. This strap is so delicate that I have no issue with her having it over her shoulder. 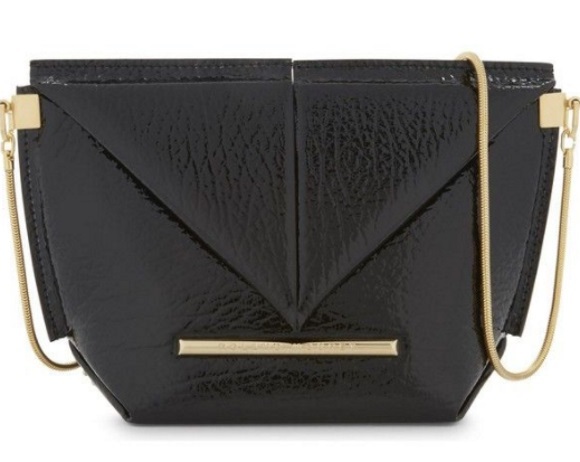 However, the bag from the other day with the diagonal strap across her chest did look awkward in my opinion. I really love this look. It is springy but formal and a nice pop of color. Winner. 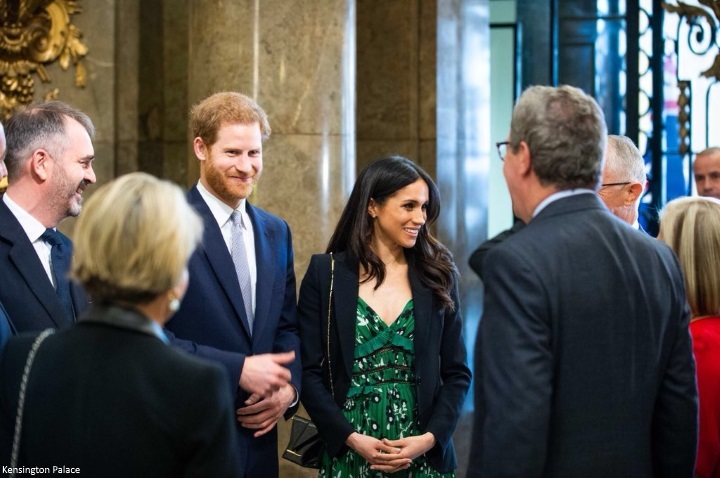 Did anyone happen to catch the clip of Harry calling Meghan by "Meg" to try to grab her attention as she was walking away from someone he wanted to introduce her to? Very cute to hear him get all casual that way but makes sense that she would hear "Meg" and turn around. Parthenia are you from Greece? :) I see,because this is a greek word meaning "maidenhood". What a beautiful dress! And what a difference it makes to put the jacket on instead of over the shoulders. She looks smashing! Head to toe perfection!!! Harry too. 😊! Hope to see her tonight! Cannot wait for the wedding! I am beyond excited to see their packed engagement calendar! Can’t wait To see all of Meghan’s new outfits! I am so happy for Harry. He has a new lease on life now that he has found his Life’s partner. He is really in his element, and is enjoying it. I love her hair today. And looking forward to a closer look at the earrings. Love the triangle bag matching the pockets on her dress. She looks lovely in this shade of green. I absolutely love this dress! I really look forward to seeing her wear it again by itself on a warm summer day! She really ticked many boxes on people's wish list! 6) She wasn't holding onto Harry. What a difference because IMHO she exuded confidence. I have a feeling this gal follows her own coverage...and pays attention. Becca, I don't know about team members and, but I do feel that some of the criticism shared on this blog have been addressed with amazing speed. I think Megan is very media-savvy and she pays close attention to her own coverage. Her skin and hair have been looking extraordinary lately! Must be getting those pre-wedding facials! 🌸 Sarah Chapman’s salon handiwork, no doubt. Like the Queen’s necklace, this outfit reminds me of Kate. It also ties in with the green theme of the Queen’s Canopy. The Queen and Meghan are having some fun, and projecting serious meaning, with their outfits. This one looks very nice on Meghan. It makes me so very glad to see how truly happy and at peace Harry has become. I love that he smiles and grins so much, and he sneaks in looks at Meghan whenever he can. It was adorable to hear him call her "Meg" during this engagement. Both of them are relaxed and content, and it is heartening and exciting to know that they are about to be married. I am a close observer of others' emotions, behavior, and states of mind, and I remembering watching Harry at his brother's wedding. While displaying a maturity and dignity that day, he appeared lonely and lost too. I wanted to reach through the television and give him a hug and ask if he needed someone to talk to. He seemed to be struggling with many things...his overwhelming grief, uncertain future, and a pervasive loneliness. Seven years later he is happy, confident, and whole. Not only has his relationship with Meghan helped him, but so too has the professional support he sought for his own mental health. He has found healthy ways to work with his grief and he is turning around to help support others with their mental health as well. He is going to be a wonderful husband and father and I look forward to watching him grow in those roles. I am very proud of William, Kate, Harry, and Meghan. Virginia, your sweet, heartfelt comments made me misty! 😭😭😭 I’m so proud of all of them as well. It’s remarkable how happy you can be when you’ve unlocked your true potential and when you’ve found someone to share it all with! Lovely comment, Virginia. I truly hope they will live happily ever after. Virginia, thank you for your heart felt words about Harry. He is the special one at least for me. I am too so very glad that he found the "right one". When one thinks of his other 2 relationships, Meghan seems to better fit everything about Harry as he does Meghan. I've just not seen Harry seem so glowing as he has been since Meghan. William and Harry have truly been blessed with the women they chose to be their soul mates. My my what a pretty summery dress. Love the green print and the ruffles. Meghan seems to know how to make "busier" clothes still look streamlined and elegant. Only thing is I would have changed the shoes -- the black pumps don't really match this summery dress. I'm really impressed with how many engagements Meghan has already racked up. And you can tell she's really present at all of these engagements -- it's not a hi bye thing at all. She's going to be such a great ambassador for the royal family. I’m giving myself a “ ta da!” seeing Meghan’s style today. I remember her wearing a red floral summer dress in Canada (Erdem, I think). This was during Invictus, and she was getting out of a vehicle. I thought Meghan might wear something like that dress to an afternoon reception. She looks beautiful and beautifully put together. Love her earrings. I think these types of earrings may become part of her “look” as Kate’s Kiki’s are a part of hers. Meghan seems to prefer delicate jewelry. Her engagement ring is the largest piece she wears. I also love how she does not wear necklaces much, so that interesting necklines and her beautiful neck are both featured and seen without embellishments to distract from either. Her skin is so beautiful! I agree anon1648. I remembered that dress too, and mentioned this in a post here a few hours ago. She looks beautiful! What a colorful and fantastic look. I love the easy, breezy swing of that fabulous green dress, and I love your editorial comment about the weather, Charlotte 😉 Thank you! Hope MM took that dress out for a spin at cocktails and dinner out afterwards! Mad props to the Invictus rep in the red jumpsuit. Now that’s a lightning bolt of an outfit. I believe the Lady in Red is Malcolm Turnbull's wife. 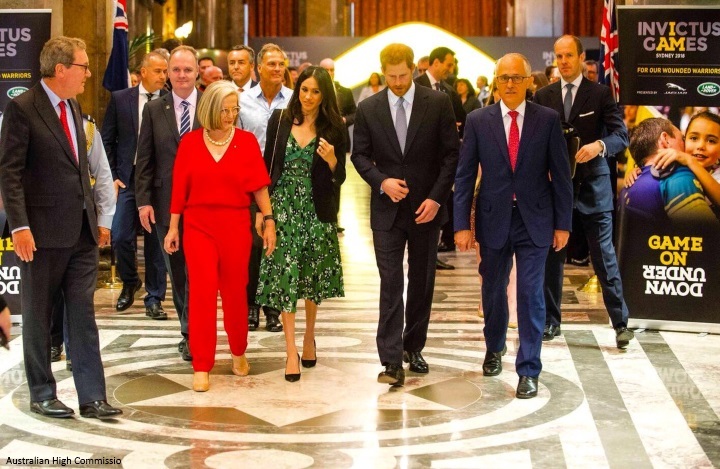 Yep, lady in the red jumpsuit was Lucy Turnbull, wife of Malcolm Turnbull. The blonde lady in black with the cropped tuxedo jacket is our foreign minister, Julie Bishop. She's also got style. Virginia, you put it so beautifully! I have seen harry standing on the balcony with the family and his expressions were sad or even angry looking. To see him laughing and having incredible warm smiles with MM was foreign to me at first. I am sure he is just devoted to her. She looked wonderful, and I'm so happy that she tucked her hair behind her ear, and then kept her hands off it. They are such a happy couple - a perfect match. Megan looks smashing. She has never let me down. What I realized about her is this - she has style. Some people wear fashion, and it stops there. Megan wears fashion but she also has style, and that's everything. I'm enthralled with her style - it's so simplistic, minimal, and complimentary for her. I love her taste in clothes/fashion. She wears everything very well, and is a stylish, beautiful young woman. Thanks for this fabulous post! Love the dress, and think Megan looks fabulous. Also, I'm not the first to mention it but Harry looks great. Seems his style has shot up since Megan entered his life. What a wonderful appearance by both of them :) Harry looks great and Meghan stunning as usual. Loved the dress. Beautifully green and springy. So happy she’s incorporating color again. May the trend continue. I love everything about this look. Its both daring yet appropriate at the same time and hopefully signals more bold colors in the future. I second everything you wrote, Donna USA@16:15! Oh my! Color and a print in one day!! Again, true to her style but appropriate and professional. She looks lovely. I agree, Dee; true to her style but appropriate. I totally support the Invictus Games. Ms Markle looks lovely and happy. I think, I forgot to type, thanks Charlotte. So, Charlotte, thank you! I'm not sure at this point if my opinion matters at all but OMG!!!! She looks great! Her hair is terrific today! Thank you Charlotte! I enjoy each new outfit and it follows the green mid length pleated dress covered shoulders with black jacket was perfect. 🌸 Silvia. Of course your opinion matters. My daughter says I was born the the wrong country. I am love the British Isles. And the Royal Family. Meghan is a superb addition and the perfect foil for Prince Harry. The are fabulous. She has style. Manners. And is self made. Without loosing her real charisma charm & intelligence. I wish them both a long & happy life. They will provide the stability & longevity for the Royal Family as seniors. Tragic Diana cannot share her son's amazing development inherited from the Mum. I wish to thank the author of mad about megan blog for her professionalism. Will the title change upon their marriage? Rumoured Duchess of Sussex? I really, REALLY like this outfit today! Meghan looks great in green. Meghan's wardrobe has changed but still stays true to her. Love the dress but I really hate that off-the-shoulder style with heavy straps on the shoulder. I'd be tempted to ditch the straps and move the side ruffles up. I guess that's the seamstress in me! Love the print, the color, the ruffles. Meghan seems to fit in to her new role/life so well and Harry looks so very happy and comfortable. It's so great to see him with his own 'someone' and not as a tag-a-long with William & Kate. I love the green dress and black blazer combo! She looks beautiful.